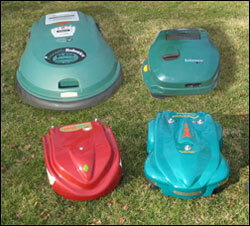 Want to know what makes one Robotic lawn mower different from the others? The information below points out what might make one robotic mower a better choice for you than another. In the tale of the tortoise and the hare, one character goes slow and steady and the other runs hard and rests. Both get to the finish line. When applied to robotic mowers, all will get the job done and also keep your lawn looking great. The Lawnbott or BigMow, as the tortoise, slowly nibbles at the lawn but works much more, as much as 16 hours a day if your lawn size and growth require it. The Robomower, as the hare, can cut grass like a traditional mower for one session averaging 2.5 hours. It has the power to mow even as little as once a week. The trade off is that Robomow cannot maintain as much grass. Although this fun analogy fits fairly well, it is not completely accurate. The ground speeds of all of the mowers is roughly the same, at a safe mowing speed of roughly sixty feet per minute. In other words, if you are worried about them running you down, you can safely "walk" away. Even if you were frozen in place, all have safety features to deal with that as well. We will cover this a bit later. The table below provides the actual grass area that each lawn mower can maintain. If you calculate your lawn size be sure to subtract the non-grass areas. You may be amazed at how much area that your house, driveway, walks and flower beds account for. All of the mowers provide a beautiful cut. They are all mulching mowers in that the cut blades of grass are small enough to fall between the grass blades and quickly begin to decompose. This eliminates raking or clippings disposal. Each brand has their own way of doing this. 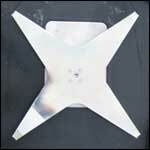 Lawnbott uses a thin, low-mass, double edged blade. This is perfect for conserving energy while cleanly trimming the tips of the grass. If an object is encountered, it will flex a bit. Robomower uses one or three (depending on model) hardened blades recessed within specially designed mulching chambers This can take on fairly long grass without a bit of visible clippings being left behind. BigMow uses thin blades similar to those you might find in a utility knife to constantly trim. Only a small sharp area is exposed. 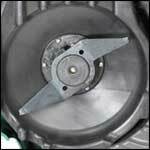 If the blade contacts something, it swings back inside the mounting disc and returns on the next rotation. All of the mowers keep safety as their first priority. The designs above all but totally eliminate the possibility of objects being thrown from beneath the mowers. Projectiles like rocks, sticks and balls launched by traditional mowers result in a large number of serious injuries each year. As of the date of this page being created, there are no recorded emergency room visits at all related to robotic lawn mowers. All of the mowers presently in production use a thin wire placed around the perimeter of the lawn to contain the mower. The lawn mowers follow it to provide an edge trim. Self charging models also follow the same wire to locate their docking station. All of the mowers use bump sensors to detect objects in their path. Robomow RL series and BigMow use rubber bumpers with internal contacts. 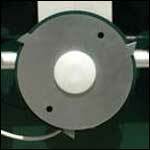 The Robomow RM series and Lawnbott models use switches activated by the movement of the shell. All of them are fairly sensitive. An additional feature that all of the mowers share is a tilt sensor that stops the blades or shuts off the unit altogether. 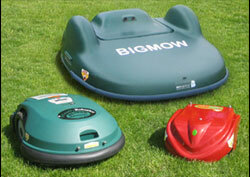 The Lawnbott LB3500 and BigMow provide an additional level of safety. BigMow incorporates a set of sonar "eyes" that slow the mower to a crawl before making contact. The "tap" is surprising light considering the size of the mower. The LB3500 Lawnbot has a touch sensitive lift handle that turns off the blade if touched with your hand. All of the mowers use standard household current to charge their batteries. Although a solar powered mower was available for a time, it proved to be less than efficient. The batteries themselves are Lead Acid (like your car), Lithium Ion (like your cell phone) or Nickel Cadmium (like rechargeable tools). Each has their advantages and disadvantages but were selected to match the operational characteristics of the particular mower. Lithium Ion has a good service life and does not tend to get weaker with age like lead acid batteries do but are more expensive. They are amazingly light. So light, in fact, they almost feel "empty" when you hold one. Their weight to available power ratio make them very efficient for robotic mowing because it takes power to haul the batteries around the yard. The Lawnbott LB3200 and LB3500 both utilize these and have available space for additional cells to boost capacity. NiCad batteries are commonly found in rechargeable tools of many kinds. They will build up a "memory" if not discharged fully before each recharge. They "think" that they only have enough power as the last few times used. The BigMow uses this type of battery. Since the BigMow discharges its batteries before returning to the dock, "memory" will not come into play and they work very well. Just a final word on Solar Power. We have investigated this and found it to be cost prohibitive for the average person to power their robot via the sun. However, it you have a special application or the funds to spare, we would be happy to assist you. Next: Which Mower is the Best?